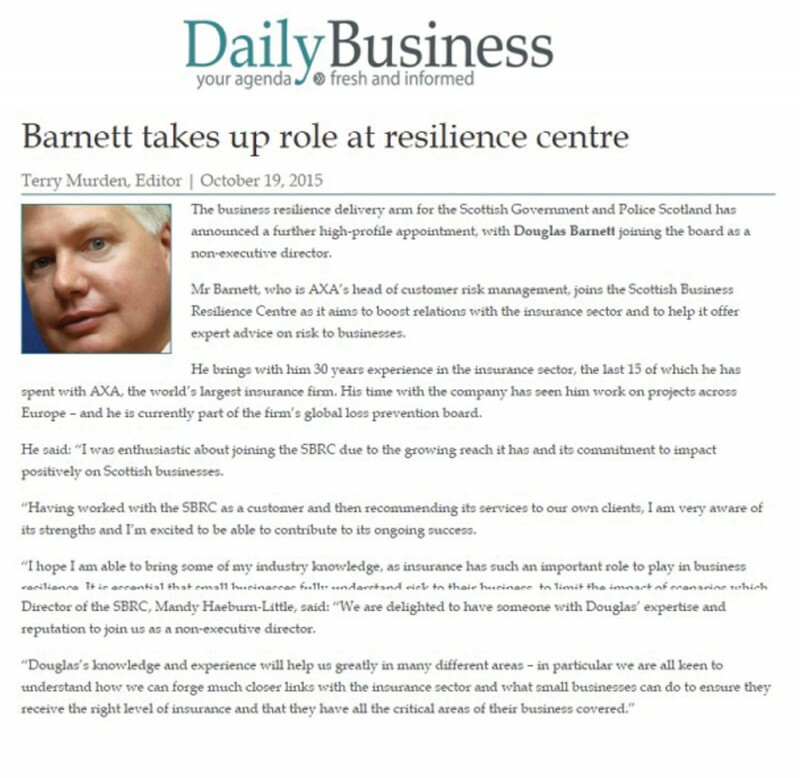 The Scottish Business Resilience Centre made an impressive appointment as they added to their team working tirelessly towards its aim of creating a secure environment for Scottish Business to flourish in. Recruiting Douglas Barnett, AXA Head of Customer Risk Management as a non-executive Director is intended to bring the centre closer to the insurance industry, offering Scottish businesses invaluable advice. With the help of multi-award winning Holyrood PR agency, this high profile appointment drew the eyes of the national business and online press. The Scotsman featured the move as the headline move in its highly regarded weekly appointments section. For the SBRC this type of coverage is crucial, as it gets straight to the core of the people and businesses they are looking to help. The Scotsman then posted the story on its influential new website, ensuring further reach to that important business audience. The website of the Daily Record, one of Scotland’s most widely read news outlets also featured the story in its business section. In addition to this, the key business websites, Daily Business and Scottish Business News Network published online to ensure that Mr Barnett’s appointment could not be missed by the business community . This Far-reaching and varied coverage was achieved as part of the Edinburgh based PR agency’s ongoing effort to increase exposure for the Centre and continues the success which has been enjoyed. Can our agency help you with your business PR?